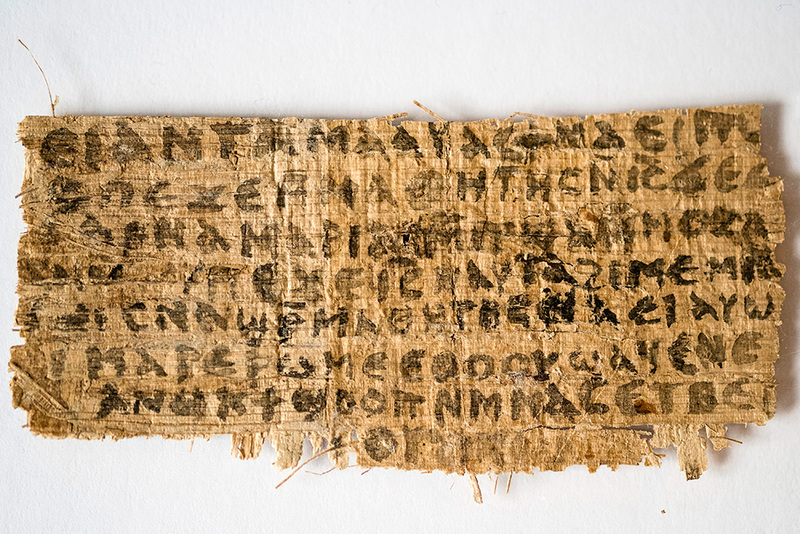 Perhaps you've seen the sensational articles releases a few days ago due to the release of a new papyrus by the Harvard Divinity School, which on it, contains the name "Jesus" and the word, "wife." Let me treat this plainly, and straightforwardly, not out of religious dogmatism, where I say childishly, "He did not!!! ", but where I can readily nip this in the bud. If Jesus did have a wife, it is not as earthshattering as some make it to be - but then again, we want the fact not a speculation. 2. The Papyrus is a 4th Century Gnostic text, written in Coptic, an Egyptian dialect. 3. Although released from Harvard Divinity School, said school does not endorse the "conclusion" that Jesus had a wife. 1. Being that the fragment only contains the statement "My wife...", the rest of the statement could say literally anything. It is completely devoid of context. It could say "My wife is she who does the will of my Father in Heaven." It could say "My wife is my bride, the Church. ", it could say absolutely anything, especially demonstrating that it was directed to a crowd of his disciples, since He was addressing "them." 2. Written in the 4th Century, during the peak of Gnostic gospel forgeries, it is classed among the dozens of false gospels and Jesus narratives that were produced at that time, where everyone and anyone used the name, power and reputation of Jesus to endorse their teaching in a book. That the book was produced some 3-5 hundred years after Jesus, is as if I started making authoritative statements about George Washington or Christopher Columbus. The fact that during the time period, people were also debating on the pros and cons of marriage for the priesthood, and used the status of Jesus as a template, it is suspicious that this would crop up during that discussion. 3. The day or two after the first press release about this came out, a second round were released with the headlines "Doubts about Jesus Wife Manuscript." The fact is, there were always doubts about it, but they only wanted to hook people in with the headline the first time around, and then hook them in a second time around with the doubts. No one at Harvard Divinity actually thinks Jesus had a wife, as attested not only by the Biblical gospels, but also through the dozens and dozens of works of full, thought out treastises, essays, letters, apologies, we have by early church fathers, who were disciples of disciples, who knew every piece of knowledge both written and verbally, and wrote it down, which not only do not mention a wife, either say nothing about it, or decline it. And a wife was not something that was bad to have. Peter had a wife. Philip had a wife and 4 daughters. But Jesus did not. Its absent from the historical record in the only 4 contemporary biographies we have about Him and his life, the Gospels. You'd think the religion of "family values" would mention it if it were true. But its not. Lastly, the media keeps saying, "At the least this shows that some Christians believed Jesus may have had a wife." This is still untrue, since Gnostics are not Christians. The media needs to do its research. The name 'Christian' applies to a certain basic sets of doctrinal agreement that the apostles of Jesus taught, not just a belief system in which Jesus is included. Gnostics hold none of the basic doctrinal points held by the apostles - those who HEARD and SAW Him. Neither do Muslims, Mormons, Jehovah's Witnesses, the Ba'hai, or any other group which has assimilated Jesus as a figure, messiah or prophet. Notice, these groups have left off the moniker, "Christian" from their name, and having left the name, they have left the faith. So click the headlines, that's what they want. There is no basis in fact here. "There are all sorts of really dodgy things about this," said David Gill, professor of archaeological heritage at University Campus Suffolk and author of the Looting Matters blog, which closely follows the illicit trade in antiquities. "This looks to me as if any sensible, responsible academic would keep their distance from it." Stephen Emmel, a professor of Coptology at the University of Muenster who was on the international advisory panel that reviewed the 2006 discovery of the Gospel of Judas, said the text accurately quotes Jesus as saying "my wife." But he questioned whether the document was authentic. "There's something about this fragment in its appearance and also in the grammar of the Coptic that strikes me as being not completely convincing somehow," he said in an interview on the sidelines of the conference. Another participant at the congress, Alin Suciu, a papyrologist at the University of Hamburg, was more blunt. "I would say it's a forgery. The script doesn't look authentic" when compared to other samples of Coptic papyrus script dated to the fourth century, he said. Some archaeologists were quick to question Harvard's ethics, noting that the fragment has no known provenance, or history of where it's been, and that its current owner may have a financial interest in the publicity being generated about it.